My Thoughts: Wow! This book is a fast paced nail biter. Diana is our current day heroine and Oxford academic. She is offered a nice sum of cash to decipher writings inside a temple at an archaeological site. Myrina is our main character in ancient times tasked with taking her younger sister into a large city for the Moon Goddess's healing powers. As the author bounces between timelines we are led into grand palaces, haunted by dark dreams, kidnapped by pirates and seduced by strong, handsome men. 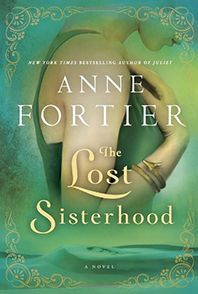 I don't want to tell you much more so as not to spoil the story, but I can tell you I want to read more from Anne Fortier. Thanks for the review! Adding this to my Books to Read board on Pinterest! Thanks for the review! I just finished Inheriting Edith, The Saturday Evening Girls Club and Orphan Train. The Saturday Evening Girls Club is based on true events in Boston's North End. Of course Orphan Train is based on historical events. All three were great books! Thanks for a good review, it sounds like a thriller. Although it is not my type of book, I am amazed at how authors can take the reader on these journeys of adventure.